Doherty, as viewed towards the southwest from Wang Cars. Cranberry Station and the Doherty Garage are visible in the foreground. 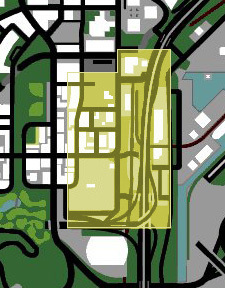 Map of Doherty in GTA San Andreas. Doherty is a district of San Fierro, San Andreas. 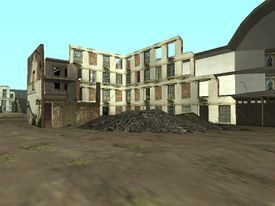 It is an industrial area located in the southeastern portion of the city, and is in the process of being renovated, an example of which being the building site next to CJ's garage (the district's need for renovation would later become significantly heightened after CJ destroys the Loco Syndicate's drug factory). To the north is King's; to the west is Garcia; to the south is Foster Valley, and to the east are Easter Basin and Easter Bay Airport. Doherty is modeled after San Francisco's Dogpatch district, which is also an industrial area situated below a major freeway and next to the waterfront. Like Doherty, Dogpatch has been experiencing a renewal, with new construction projects, a burgeoning arts scene, and other signs of gentrification. Doherty is also home to members of San Fierro Rifa, who will occasionally accost CJ and question his gang-banging status, with a positive response guaranteeing a physical confrontation. Prominent hang-out spots include in front of the Doherty Garage and in front of the Brown Streak Railroad-served Cranberry Station. Construction site in the northern Doherty. Doherty is the first stop for Carl Johnson after entering San Fierro, as he heads for the garage he won in a race against Claude and Catalina, which turns out to be an abandoned Xoomer gas station. Kendl persuades Carl to ignore his frustration over feeling cheated, and to instead transform the defunct garage into a new business. Carl then befriends and employs Dwaine, Jethro and Zero, who, along with Cesar Vialpando, begin to run the garage, turning it into a successful chop-shop. Carl destroys a large structure in Doherty that was being used by the Loco Syndicate as a drug factory. He also purchases a safehouse just south of his garage, and later purchases Wang Cars, a car dealership located on the border of Doherty, King's, and Downtown. This dealership's success is achieved through numerous car thefts by Carl and Cesar. Carl continues to run both automobile businesses throughout Grand Theft Auto: San Andreas. This page was last modified on 27 July 2012, at 01:38.